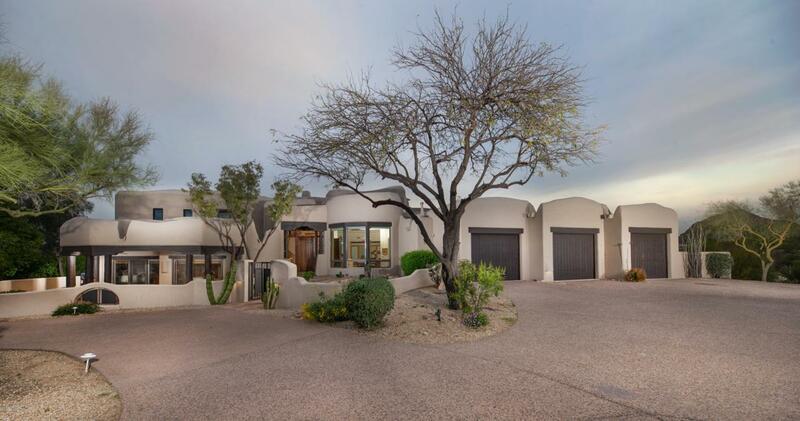 Priced under appraisal, this captivating Glenn Moor/Troon home has just been selectively remodeled with spectacular mountain, golf course and city views. The grand entrance invites you into the foyer of the living room's dramatic wood beam ceiling, overlooking the negative edge pool on to the golf course, mountains & city views. The well-designed floor plan features 4 Bedrooms, Exercise Room & 4.5 Baths. The kitchen is perfect for entertaining including Wolf stainless appliances, stone back-splash & plenty of storage. The family room and breakfast nook feature a 100+ bottle wine storage, opening to the resort style patio. The swooping staircase leads to the stunning, remodeled Master Suite with hardwood and marble floors, featuring a sitting area open to a balcony with incredible views.